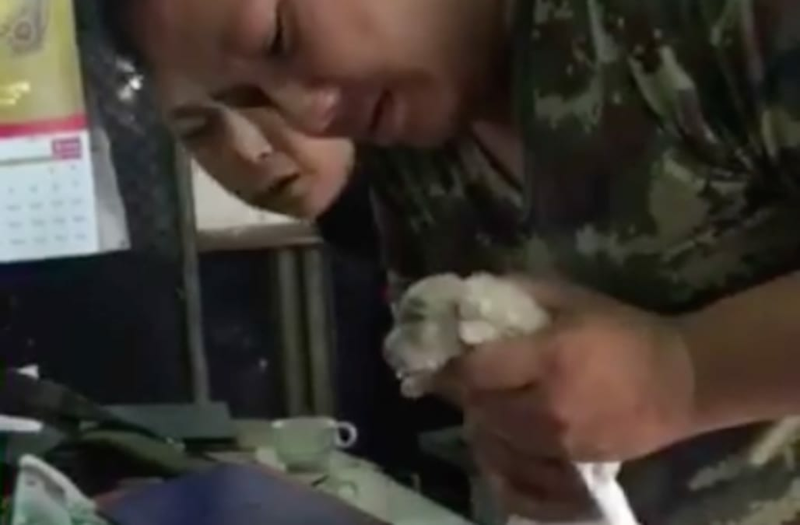 An emotional video that shows a Thai soldier give CPR to a lifeless puppy and eventually bring it back to life is making its way around the internet. The 2-day-old puppy was reportedly found in a garage by the soldiers' barracks after a downpour. When the dog's mother was unable to reach her puppy in time, a soldier recruit identified as Weeraphon Sukudom quickly took action. When the recruits found the puppy, it was already "blue," revealed reports. Wrapping the lifeless dog in a towel, Sukudom delicately -- yet effectively -- started patting and shaking the puppy in an effort to get it to breathe. At one point, the soldier even attempted mouth-to-mouth resuscitation. Towards the end of the video, you can see the puppy finally cry out and gasp for air in a room of cheering troops. Only later was it revealed that Sukudom, despite his heroic actions, has never had to use CPR before. The video has garnered nearly 12.2 million views since its posting on Facebook on Friday, with many commentators applauding the work of the selfless men.